War of the Spark spoiler season has finally started, and we’re starting to see what the set is all about. With a bit of information we can infer more, and that means the market is already in motion. For example, the reveal of the proliferate keyword on a single card implied more support to come, and the market has reacted with spikes on cards like Atraxa, Praetors’ Voice and Contagion Engine. The set’s impact is going to be felt everywhere, from Commander spikes like Atraxa, to Eternal formats, and of course to Standard. Zombies look to play an important part in War of the Spark. They can be found in four colors so far and are central to the amass mechanic. That mechanic also has a powerful flagship in Dreadhorde Invasion, which has been compared to Bitterblossom. Eternal Taskmaster is high-quality Zombie with an ability fitting for the tribe, and helps lay the groundwork for a real Zombie tribal deck in Standard. Liliana, Untouched by Death has already spiked, but Death Baron remains a very juicy opportunity. It’s showing clear signs of growth and won’t be so cheap for long. Also consider the card was over $20 before being reprinted in Core Set 2019, so the long-term potential is high. Zombies in other colors also open up the possibility for a multicolor Zombie deck. One pairing is green, with the new Storrev, Devkarin Lich being a big draw. That brings attention to Underrealm Lich, another Golgari Zombie with graveyard synergy. It has shown some growth online, up from 0.8 tix to 1.1, so there might be paper growth to follow. As a $2 mythic that will be in Standard for over another year, there’s potential. Like Storrev it also happens to be an Elf, and that crossover demand could help if Elf tribal sees more support. The set does bring a very strong new Elf in Paradise Druid, so it’s a possibility. Red is also shaping up to be a Zombie color, and strong one at that. There is a lot of support for amass in red so far, including Widespread Brutality. Dreadhorde Arcanist is one of the best-looking cards in the set so far, and its Zombie status could take it even further. Death Baron increasing its power would allow it to cast more expensive spells, for example. Dreadhorde Butcher is another strong red Zombie, and another beneficiary from an anthem effect. A cheap spec that might yield some large gains is Thud, which is being talked about because of its potential with Dreadhorde Butcher. It unlocks the death trigger, and with a pump spell like Collision // Colossus can actually lead to a turn three-kill. It’s still about a quarter, but has actually shown on up on lists of moving cards this week. Uncommons from Core Sets becoming expensive is not out of the ordinary. I could easily see this selling for $1 or more at some point, especially if you can offload them in person at events for a premium. Another nasty interaction from War of the Spark is the leaked Ral, Storm Conduit going infinite by copying the front end of Expansion // Explosion. This leads to a chain-reaction of copy triggers on a spell of your choice, with Shock being the cleanest option to end the game. 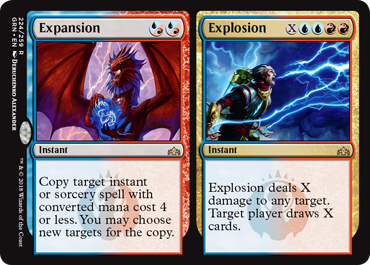 Expansion // Explosion is already a premium Standard card, and the planeswalker looks decent on its own, so it’s no stretch for this to become a real top-tier deck. Whether it’s when Ral is officially spoiled, or not until it becomes a staple, I think it’s only a matter of time before Expansion // Explosion sees significant growth. Rakdos in general looks to be one of the best guilds in the set, with some great cards like Angrath’s Rampage. No surprise we’re seeing increase in some Rakdos staples online, including Blood Crypt and Rix Maadi Reveler. The Goblin tribe wasn’t left out of War of the Spark either, and Krenko, Tin Street Kingpin looks pretty powerful. Goblin Trashmaster has nudged up in price in both online and paper. Given that it doesn’t have much downside at this level below $1, this might be a good spec. Selesnya is also seeing increased demand, likely on the back of the new Ajani, the Greathearted. It brings back memories of Ajani Goldmane, which was a Standard staple, and should become a staple now by outshining Ajani, Adversary of Tyrants. Trostani Discordant is particularly attractive, as is Knight of Autumn, which could also benefit from proliferate shenanigans in a Bant deck. A card with the potential to get much better with War of the Spark is Benthic Biomancer. It’s the perfect card to pair with proliferate, since each added counter will trigger a loot effect. The leak of Roalesk, Apex Hybrid shows that proliferate could be quite powerful, and Benthic Biomancer has already tripled on MTGO from 0.1 to 0.3. I think it’s a real bargain now under $1, especially given that it has become a staple of Modern Merfolk and has utility beyond Standard rotation. Niv-Mizzet Reborn brings attention to five-color decks, whether in Standard or Commander, which explains an uptick in the price of Chromatic Lantern. Its price bottomed out at $3.50 but is now up to $5, and doesn’t look to ever be cheaper until it’s reprinted again. The card was $15 before being reprinted, so demand will likely catch up and bring the price above $10 eventually, even if it does take a few years. I like Chromatic Lantern for its long-term potential, and any Standard play for Niv-Mizzet Reborn would be bonus. One card that might go hand-in-hand with Niv-Mizzet Reborn if it does make its way to Standard is Sarkhan, Fireblood. It provides a nice way to get around the restrictive five-color mana cost, allowing it to be cast in a three-color deck. Bolas’s Citadel might make an impact in Standard—but it’s obviously going to see a ton of play in Commander and all variety of casual formats. A very simple and extremely powerful way to abuse the card is with Sensei’s Divining Top, which basically turns it into a Yawgmoth’s Bargain. There has already been a noticeable uptick in the price of Sensei’s Divining Top, and I like its long-term prospects. It’s pretty wild, but Leveler is being discussed as a way to speculate on the new Jace, Wielder of Mysteries. Its static ability is the same as that of Laboratory Maniac, so combining it with Leveler would lead to an instant victory. Whether or not people are actually going to build decks around this remains to be seen, but foil copies doubling from $4.40 to $9 means at least someone is banking on it.